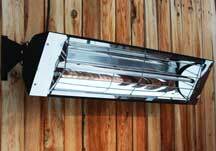 Perfect Kennel Heaters are a Cleaner, Greener, Safer, more Efficient Choice. In today's world, protecting our environment, our health, and managing cost have become a top priority. With a Perfect Kennel Heater, you can protect your dogs from the cold without producing the negative environmental effects created by most gas-fired heaters. Traditional gas burners are often less than 50% efficient and emit carbon monoxide and other hazardous gases as a bi-product of combustion and burning fuel. By contrast, our energy-efficient infrared fixtures convert over 90% of input energy directly into radiant heat, and operate for just pennies per hour. Perfect Kennel electric infrared heaters are safe for use outdoors or indoors, operate silently, emit no greenhouse gases or unpleasant odors and do not require ventilation. Two 120v models equipped with power cord. One 240v model designed for ‘hard-wired’ installations. Mounting heights can vary between 6’ and 9’. Simply select the model that will provide the coverage you are looking for in your particular situation.